Due to the increasing use of cast aluminum components in automotive and aerospace applications that involve cyclic loading, fatigue and fatigue crack growth characteristics of aluminum castings are of great interest. Due to economic and environmental requirements, it is becoming increasingly important to reduce vehicle weight. For such an objective, Al-Si alloys such as Al 356.0 (Al-7Si-0.3Mg) and Al 390.0 (Al-17.0Si-4.5Cu-0.6Mg) have been commercially used to produce an engine block due to their high strength over weight ratio. The engine block works under mechanical and thermal cyclic stresses in relative motion with other engine parts. High fatigue strength and good wear resistance are critical properties to engine block life. Under cyclic stresses, microcracks can initiate at some stress concentration sites and then propagate until the final failure of a material. The whole fatigue process largely depends on the microcrack initiation and propagation as the final failure of the material happens quite quickly. In high cycle fatigue, as the cyclic stress is comparatively low, a large fraction of the fatigue life is used in microcrack initiation. Wear is another major failure of engine block material. This process is attributed to a couple of factors. Firstly, the presence of hard particles and chemicals in the cooling and lubrication fluid results in abrasive and corrosive wear. Secondly, erosive wear is also significant from the impact of hot air and gases. Thirdly, friction between the block wall and piston ring can produce adhesion even in oil lubrication and finally, fatigue itself also contributes to the wear of engine block. In addition to high fatigue strength and wear resistance, engine block material is also supposed to possess good castability and machinability. This is because the engine block has a very complex structure. It is initially cast and thereafter subject to mechanical machining. In the paper of JIANG Xiao-song et al. : the test pieces were hot isostatically pressed (HIP) prior to the heat treatment. The HIP process reduces microshrinkage and gas porosity within the casting to a negligible level by applying high temperature and isostatic pressure for a specified period of time. Its chemical composition was measured as 7.41%Si, 0.27%Mg, 0.138%Fe, 0.314%Mn, 0.001%Cu, 0.006%Zn, 0.006%Ti, 0.001%Cr and Al balance (mass fraction). Al-Si-Mg alloy was subjected to a T6 heat treatment, consisting of solid solution heat treatment at (538±5)°C for 5.25 h, followed by water quenching and artificial aging at 160°C for 4h. The yield strength (σ0.2), ultimate tensile strength (σm), elastic modulus, shear modulus, reduction of area and elongation of the Al-Si-Mg-T6 alloy are 170.2 MPa, 196.6 MPa, 70.0 GPa, 26.3 GPa, 0.68% and 1.53%, respectively. The specimens are in the shape of cylindrical rods as shown in Fig.1. Each specimen was tested under uniaxial cyclic loading using the Instron 8032 system. To investigate the fatigue behavior of Al-Si-Mg alloy, specimens were exposed to different stress amplitudes from 115 to 185 MPa. These experiments were conducted based on cyclic stress controlled at frequency of 10 Hz, a sine wave forms at a stress ratio of −1, in air at 22°C and relative humidity of 40%. The microstructure characteristics of the Al-Si-Mg alloy after exposure to fatigue testing was observed using a H-800 TEM machine. TEM samples were prepared in the following steps: a slice of about 1 mm thickness was cut beneath the fracture surface or the middle of the working segment, then the slice thickness was decreased to about 50 μm using carborundum paper, then the thickness of foil sample was continued to decrease to about 20 nm by twin-jet electropolishing. 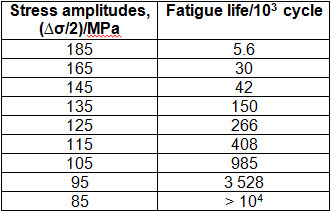 The fatigue characteristics under different stress amplitudes were examined and the effect on the fatigue life was shown in Table 1. From Table 1, the result shows that with the reduction of stress amplitude, the fatigue life of Al-Si-Mg alloy increases significantly.